I’m hoping some of you can share your favorite flavors for my continued exploration of this character of vape. I really enjoy Cinnamon Danish Swirl from Capella. It has been a great flavor for me with minor additions and toppings. Also on that list is Wonder Flavors Cinnamon Pastry. I REALLY like Rich Cinnamon(FLV). I find it provides that cinnamon “punch” with a bakery-type cinnamon rather than a candy-like(Think Red-Hots) cinnamon. There is a caveat with Rich Cinnamon, though: USE IT SPARINGLY. Like, below 1%-WELL below. I use it at about 0.3% and even then it can come on a little strong. But it’s just so. Damn. Good. I just ordered a 4oz bottle of Flavorah Cinnamon Crunch. I am not messing around anymore. I was ordering this Concentrate about 3 times a year. Try FLV Frosting with the CDS. I couldn’t make myself like CCI but Frosting is delicious. Start low! I just tried some cinnamon roll juice at a local shop and discovered I love this flavor profile, lots of flavor suggestions on here but does anyone have recipes they want to share? 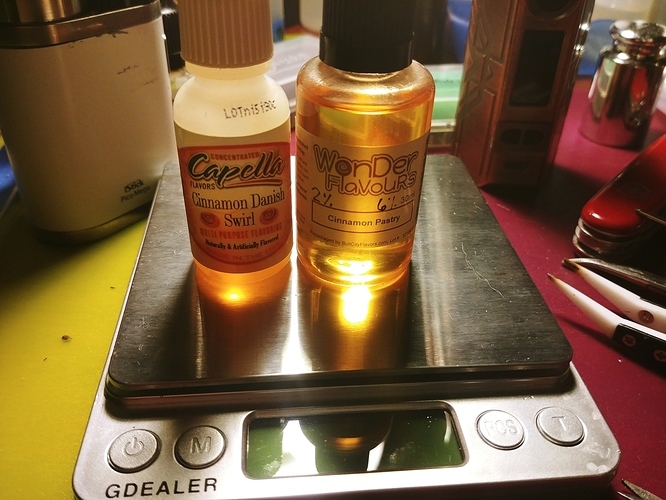 I’m probably gonna buy several 10ml bottles of different cinnamon roll/pastry/danish next time I order, anything I should avoid? What %s have been best for you with this one? I’ve been staying around 1% and like it a lot. The Cinnamon aspect is pretty subtle to me, which I like. I tried at 4% once, way too much after a steep. After making a couple of recipes with FLV Pumpkin Spice, I can’t stop mixing up something different with it, luv luv that pumkin !! I had this flavor way back when (ego kit days) and SF at 12% lol I just recently re ordered and to be honest have not done my due diligence with it as of yet in terms of testing and have been just dropping it in mixes in the 0.75-1.5% range. I just wanted to update this with a bit more experience than this “once” thing i wrote. It was something else in that mix that was bugging me out. Danish Pastry NF is just fine up to at least 4%. That’s as high as I’ve taken it, anyway. This one got really good around 30 days steeped.